In unfavorable situation, when PUB.EDB files fails to mount or fails to respond the users request then a tool to extract public folder from EDB to PST file is searched. But several considerations are made while choosing an application to deal with crashed Exchange server state. There can be multiple situations where deployment of such efficient software is much required. Here in the following section, a detailed discussion is made about functions that are supplied by the Public Folder Extraction Tool. Good-quality software is always appreciated especially when Exchange pub.edb files are corrupted and Exchange server is offline. Similarly a quality-enriched application is mentioned below (read all features). What should be most basic qualities of the application? What are essential areas where the respective tool must be applicable? 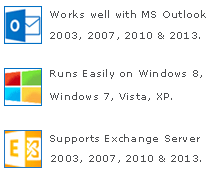 Compatible with All Exchange Editions: Live in compliance with Exchange 2010, 2003 and 2007 server edition. Without any trouble gain interoperability. Save Multi-Level Folder Structure: Extracts entire folder, subfolders and personalized folders in hierarchal format. Retains the original positions of every component. Extract All Items Pub.EDB: Exchange Public folder extractor tool proficiently pulls out all shared emails, appointments, calendars, journals or shared tasks and save into PST file. Repair Corrupted Pub.EDB: Perfectly repairs damaged fragments or recover unreadable components without missing a single data bit. Extract Data when Sever Unavailable: Extract public folder to pst especially when Exchange server is offline, forced shutdown and corrupted. As well as the takes out data from dismounted, disabled or disconnected database. Depending on all these criteria’s a Proficient EDB Converter has been designed which satisfies all requirements of users. In addition to folders, extract mailboxes into Outlook PST file. Get all desired functions from 2-in-1 application. So, download the Exchange Public folder extractor tool to meticulously convert Offline, Dismounted and Corrupted Pub.EDB to PST file. The highly proficient app keeps the correct composition of all internal components and restores deleted items as well.